Here are the other 3 items I reserved, hope the pics are working now. Did some work. Just mocked up a bit of the front end. Basically just a wait game now for parts. I'm STILL undecided on that aluminum chassis... we'll see, I'll have plenty of time to think about it. thank you very much for the overdose info, My Fr-d is gonna use some of those parts as well :) you will have to let me know about the front knuckles, and how you like them? anyways nice looking build, looking forward to seeing it finished. Hey, no problem! Lookin forward to your FR-D build~ I have a set of Overdose Shock Towers reserved as well the Type-C upper arm mount that they came out with. They should be released some time this month...hopefully we can get our hands on them soon!! The Knuckles are from TN-Racing/H2Riku. The have some built in KPI. Unfortunately this build is a bit of a long term one, I am hoping to get the car running by summer(earliest), so it may be a little while until I can offer you up some feedback. thats lurvely. about $300 for the front end? hehe. I feel the pain. that way you can just bolt to the tower support and you don't need the type c holder. I've got these on order. mine won't be ready for a while either. 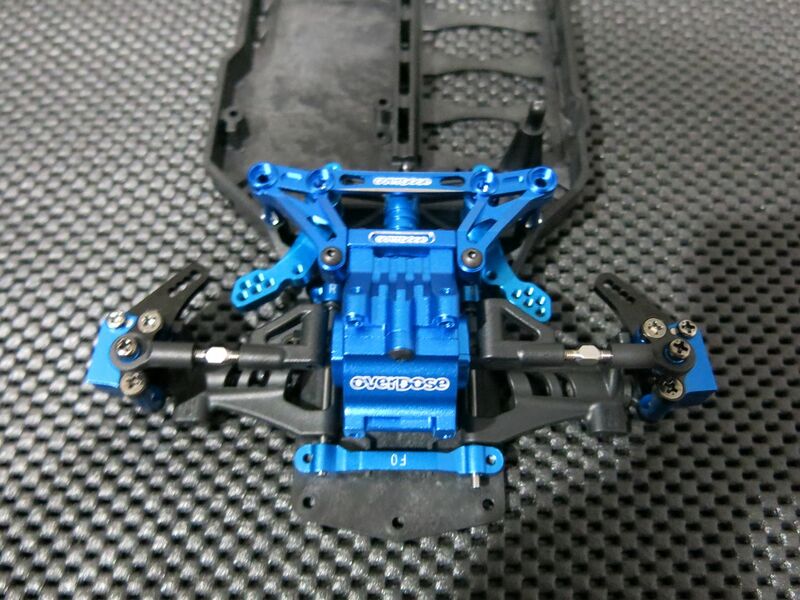 you can get the blue type C alloy upper suspension in blue from option #1 and lowers from yeah racing.. 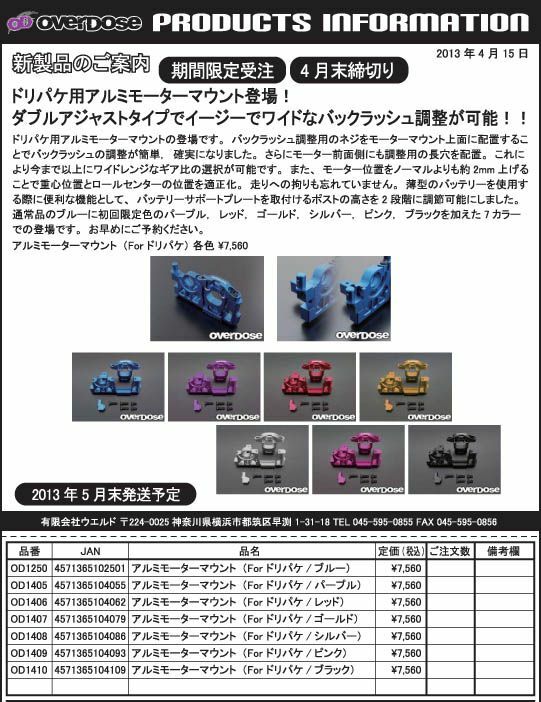 I was dissapointed in the overdose engine mount. it looks a bit complex. The imadoki engine mount is really nice and compact. 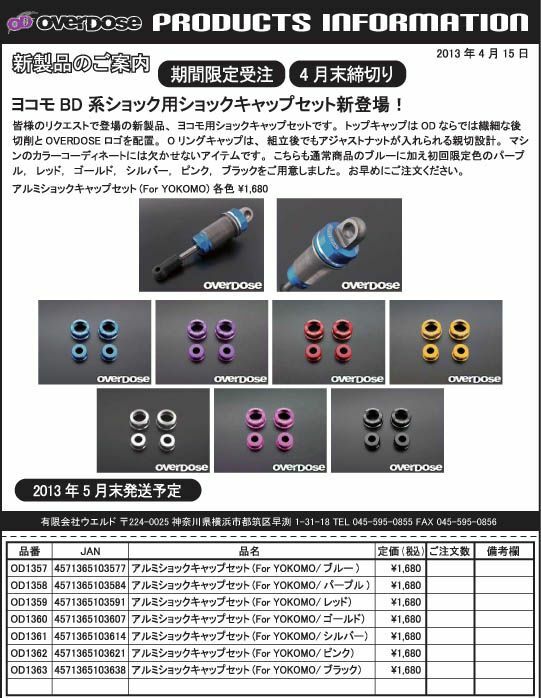 you know you can use the overdose outer adjuster rings and lower spring holders on the Yok dampers also. I have them on the DRB. the new caps will complement nicely. I have the adjuster rings. Haha I'm scared to add up how much I've spent XD I have all the little parts tags still, maybe I'll add it up one day~ I just recently started considering the Yeah Racing lower arms... I figured I did this much, why not go aluminum lower arms haha. I recently saw those TN-Racing parts, but never clued in that it can be used for a Type-C setup. That's awesome. Can't wait to see what you have in mind for your RWD setup. Overall, pretty happy with how both my cars are coming together. The DIB has been a blast to drive now that the weathers been getting better and I've been able to get more wheel time. I purchased a RC926 Twin Spring Set /w 1.3mm diameter springs, so I'll finally get to play around with suspension tuning, and try and dial it in some more. 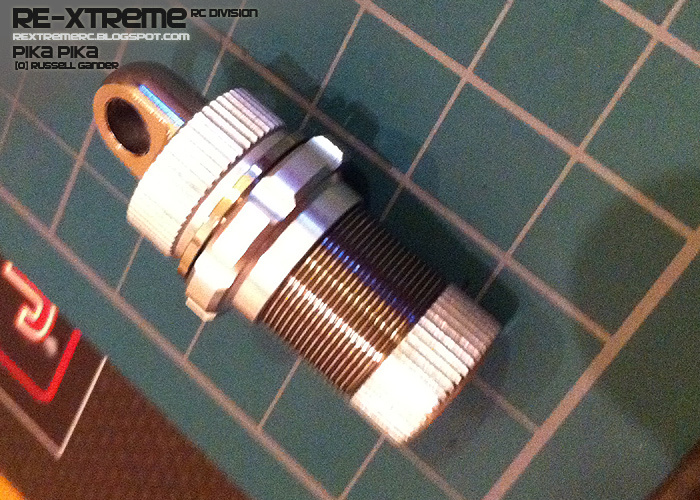 Check this new Ject / overdose drift package conversion with new Overdose parts fully POLISHED! I might have to re-do my Keyence motor case and other marts on my DRB. this is BLING. RC926 and Ject both have new chassis conversions. a 2.6 or 2.0mm chassis and upper deck. I will eventually do something. but these are way off in the future. I mean Way Way off. OMG. 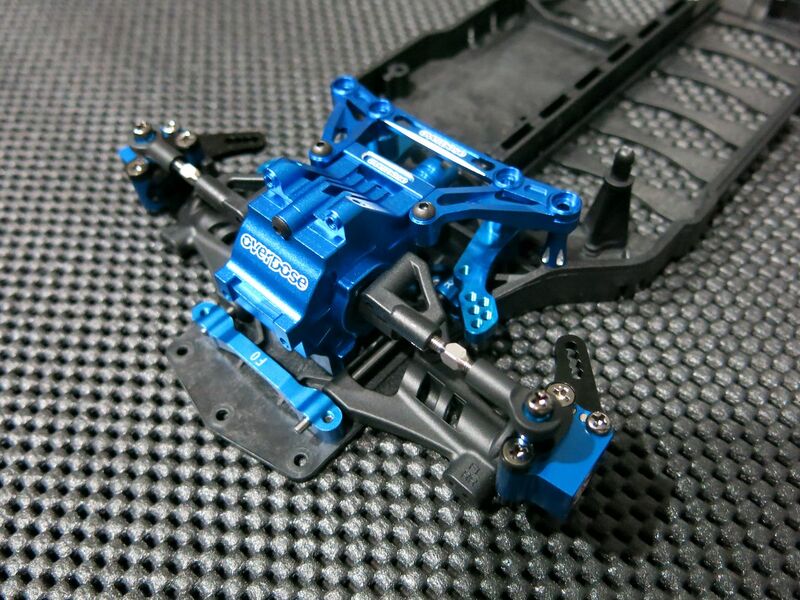 That Ject Racing / Overdose chassis looks absolutely insane. That motor looks awesome too, should compliment your DRB nicely if you do yours as well. 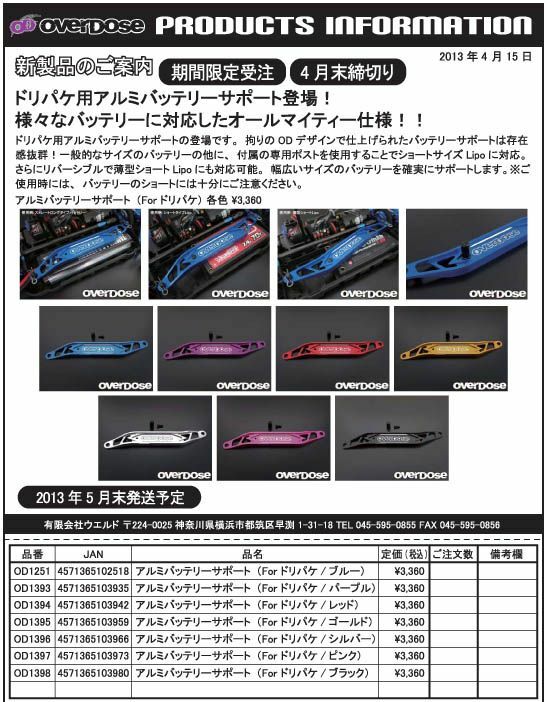 Are you planning to upgrade to the Team Suzuki arms on your DRB? I originally wanted to build a Ject Racing conversion after finding out about it on RC-Art's webshop, but I basically ran into 0 information available about it. I eventually found their website, but even then I couldn't figure out what I needed from Ject Racing to run their Triple Converter Mars conversion. Google Translate wasn't a whole lot of help either. It said additional items were needed from Ject, but I could never figure out what :S Definitely something I'm still interested in building down the road if I can ever figure out the part numbers needed, since I have so many leftover parts. That, or an Imodaki conversion. Either way, thanks for sharing! That first chassis was especially inspiring. I love assembly time! Looks awesome! I'm still sorting things out as far as what screws I'll be needing ect... I'll eventually hit you up for one when time comes though!